It’s July and you know what that means: it’s time for NCAA Football. Something of a yearly tradition that comes before the start of the season and during the peak of summer heat, it feels like excitement for football starts the moment the next NCAA game gets placed on a store shelf. Being the only game in town, it’s also about the only motivation many need to pick it up, along with the fact that EA have consistently proven capable of making a solid collegiate football experience. After Robert Griffin III was featured on last year’s cover, he proceeded to blow up the professional football world, with Denard Robinson now hoping to have similar luck this year running for the reinvented Jaguars. Indeed, much can change between NCAA Football releases and this year proves to be no different. Gameplay, however, remains largely unchanged from the past few NCAA Football games, which isn’t a bad thing considering how smooth and slick everything plays. While we’ll have to wait until next gen to experience the much-touted Ignite Engine, Infinity Engine 2 handles things just fine. Players move with real weight and momentum and collisions are no longer predetermined thanks to the Force Impact System. This gives smaller and bigger players different advantages, with larger defenders now able to smash smaller players in cringe-inducing ways often only seen in a real game of football. More emphasis has been placed on the Option this year, with thirty new Option types added, such as Triple Options or Shovel Options, and a whole new playbook. This adds a new layer of strategy, allowing players to read defenses and change plays on the fly. A new stumble recovery mechanic has also been added, allowing adjustments to be made with the right analog stick if you’re starting to trip, or dive forward for extra yards as you’re beginning your brave decent to the turf. One of my favorite new additions is acceleration burst, which allows players to hold the right trigger to speed up and get around a defender. Holding it for too long makes the player run out of gas, however, so the move must be used conservatively. Eight modes are included: Nike Skills Trainer, Exhibition, Ultimate Team, Dynasty, 2013 Season, Xbox Live and Road to Glory. Exhibition is the shortest route to instant satisfaction and simply lets you choose two teams, the weather (with a live feed from The Weather Channel), stadium, difficulty and quarter length and get at it. Inside Exhibition, there’s also Practice, Coach, One-Button Mode and Mascot Mashup (which as usual has teams of mascots going up against each other and simply must be experienced). Nike Skills Trainer is a great addition this year, even with the blatant sponsorship, allowing players to hone their skills through a series of tutorials in running, passing, defense and pre-play. It takes practice to perfect and memorize everything, but is worth spending the time if you plan to be competitive at the game. Better still, doing well will earn award medals that will grant special items for use in Ultimate Team. The highly addictive Ultimate Team Mode from Madden makes its debut here and allows fantasy teams to be built out of the best players available. The core of the mode is the Head-to-Head Seasons, which puts players in a ten game season in hopes of a seed in the eight team playoffs. Winning gains new levels and higher-level games, while winning tournaments gains better prizes. There’s also Solo Challenges, roster management tools and the Auction House to enhance the mode. The Season Mode is a truncated version of Dynasty or Ultimate Team Mode and simply allows players the reigns of their favorite team as they go through its entire 2013 season, with real-world insights on what’s happening around the football world. Everything is 100% accurate, allowing players to be in control of their team’s destiny. Dynasty has been enhanced this year with Coach Skills and Power Recruiting. Coach Skills add an RPG-like progression system to the game, while Power Recruiting streamlines the recruiting process. Coaches earn XP through wins, signing prospects and more, with XP granting a skill point. Skill points provide multiple abilities spread across two skill trees: Recruiting and Game Management. Offensive and defensive coordinators have their own skill trees, leading to a lot of time being spent to crafting the most efficient coaching squad. It’s a very enjoyable mode that those more into the statistics of football and less into tackling will likely spend most of their time with. Graphically, the game looks strong, although it’s certainly a series that’s past its prime on current generation consoles. It’s hard to be impressed with any of the graphical flourishes it throws at you when EA has been constantly showing off the nuances of the upcoming Ignite Engine. 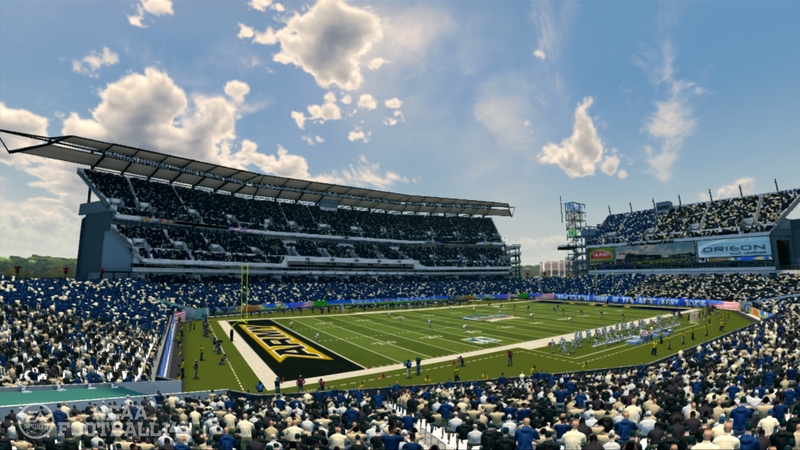 Menus have been streamlined in the way Madden 13’s were to be more intuitive and stadium chatter has been enhanced with new chants to make you feel like you’re in some of the loudest houses around. Stadiums are very realistic with the correct buildings in the background. One thing I was impressed by is that the giant scoreboard my alma mater, The University of Arizona, installed this year is reflected in this game, which is a great example of paying attention to detail. 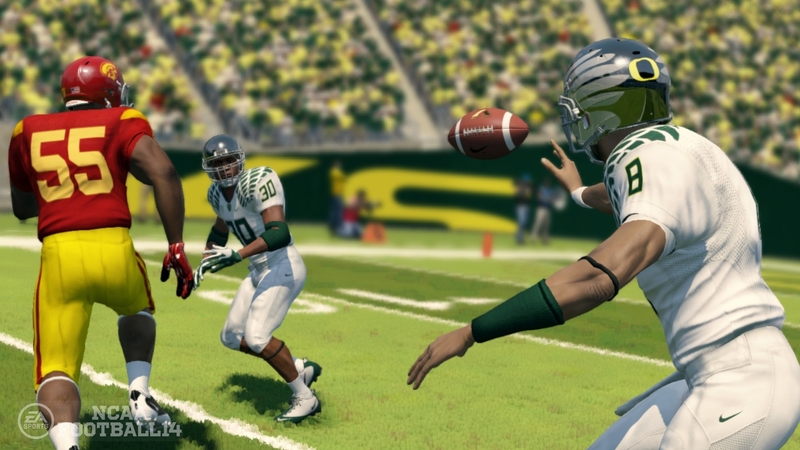 The last game in the series before the next generation hits, NCAA Football 14 has it tough in ways that only NCAA Football 2001 and 06 have had before it. 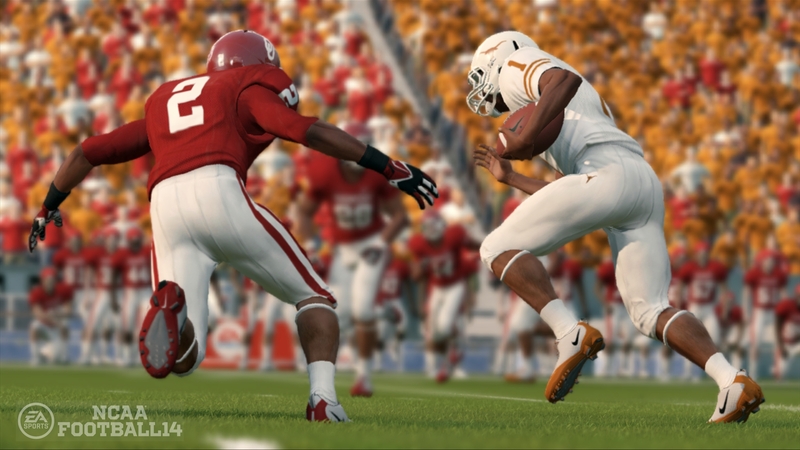 Many are looking towards the admittedly impressive thrills of the upcoming Ignite Engine, something that the next NCAA Football game will likely include, making this edition about as long in the tooth as a sports game can get. Those simply looking for a solid game of collegiate football should ignore all that, however, as NCAA Football 14 offers the same quality the series has been known for this generation with some great tweaks and implementations added. Madden 25 will likely take the crown for the best game of football this year, but those who make NCAA Football a yearly tradition have no reason not to add this solid addition to their collection.